Registered dental hygienist Tami Farmer is a graduate of the Medical College of Georgia with more than 25 years dental experience. She is currently working in a private practice in the suburbs of Atlanta. She also writes continuing education courses for dental professionals and has won awards for her dental health presentations. A toothbrush and some baking soda may make your teeth whiter. Many things stain the teeth and there are different ways to remove various types of stain. Staining can occur on the outside or inside of the tooth. No type of brushing can remove stains that have been incorporated inside the tooth. But brushing with baking soda or using baking soda toothpaste may remove surface stains on the outside of teeth. Surface stains on the outside of the tooth can be caused by poor oral hygiene, tobacco, foods, beverages, medications or a combination of these. Brushing with baking soda can remove light surface staining on the teeth. Mixing water with baking soda forms a mildly abrasive paste. When used with a toothbrush, this paste combines with the action of the toothbrush to remove surface stains. Staining on the inside of the tooth can occur from things such as too much fluoride, the antibiotic tetracycline, genetic causes or unknown events. Brushing does not get inside of the tooth and will have no effect on these types of stains, no matter what you brush with. Stubborn surface stains, such as heavy tobacco stains, must be professionally removed by the dentist or dental hygienist at a cleaning appointment and cannot be brushed away. Cavities can also cause your teeth to stain and these stains are not affected by brushing. Stains from cavities may be white and chalky or gray, brown or black. Toothpaste polishes the teeth to get them clean. Ingredients in toothpaste include fluoride to make the teeth more resistant to cavities and flavoring to provide a fresh taste. Abrasives, such as baking soda, are added to toothpaste to help remove stains and give the teeth a shine. Abrasive ingredients can cause tooth sensitivity if they are too rough on the teeth. If your teeth seem more sensitive after using a homemade baking soda paste or a commercial toothpaste with baking soda, stop using it and talk to your dentist. 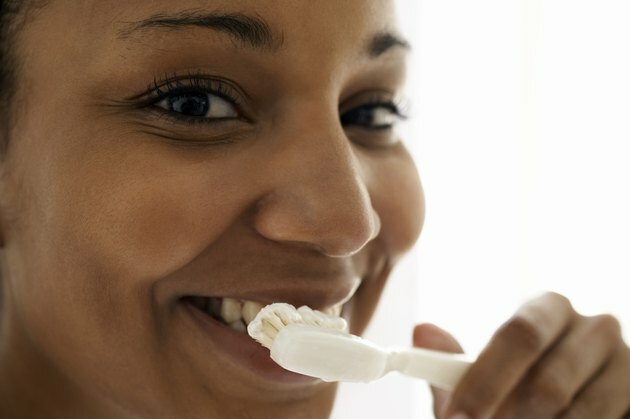 Brushing with baking soda or a baking soda toothpaste requires using a proper brushing technique to remove stains effectively. You should brush your teeth at least once in the morning and once in the evening with a soft toothbrush with the baking soda and gentle pressure. Aim the toothbrush at a 45-degree angle to the gum line and use small, circular strokes. Then, roll the toothbrush toward the chewing surface of the tooth. When brushing the chewing surfaces, you can use a back-and-forth motion.